‘investing in biodiversity for people and planet’. The Convention’s objectives include developing national strategies for the conservation and sustainable use of biological diversity, as well as the fair and equitable sharing of genetic resources. DNA barcoding was officially introduced at the 11th meeting of the Conference of the Parties (COP 11) held in Hyderabad, India, in 2012. It was further reinforced in decisions at COP 13 (Mexico, 2016) and COP14 (Egypt, 2018). DNA barcoding was first proposed in 2003 as a tool for specimen identification and species discovery. Today, it is being used for various regulatory purposes including product testing for consumer protection, rapid identification of invasive alien species and endangered species being trafficked illegally. 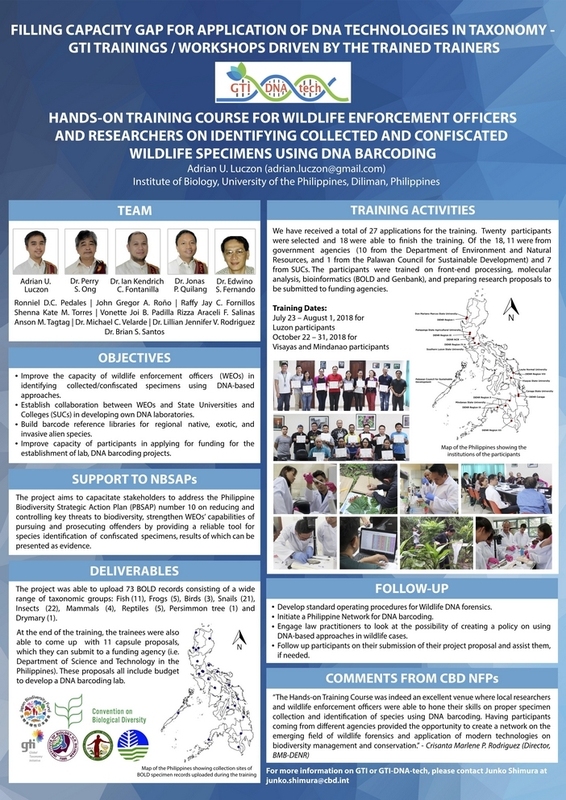 At COP14, Parties were encouraged not only to foster the use of DNA barcoding technology for rapid identification of priority taxa but also to support related capacity-building activities in line with the strategy for the Global Taxonomy Initiative. The Global Taxonomy Initiative Forum (GTIF), titled ‘Removing the taxonomic impediment for all citizens’, was held on the margins of COP14 on November 16, 2018, and was organized with the financial support of the Japan Biodiversity Fund. To aid in implementing the CBD, scientists and government representatives discussed ways of overcoming the taxonomic impediment, our inability to efficiently identify species. The GTIF symposium opened with a keynote speech from Carlos Manuel Rodriguez, Minister of the Environment and Energy of Costa Rica. When asked what we can do to overcome the taxonomic impediment, Rodriguez said that the two most important tools changing the rules of the game are the internet and DNA barcoding. 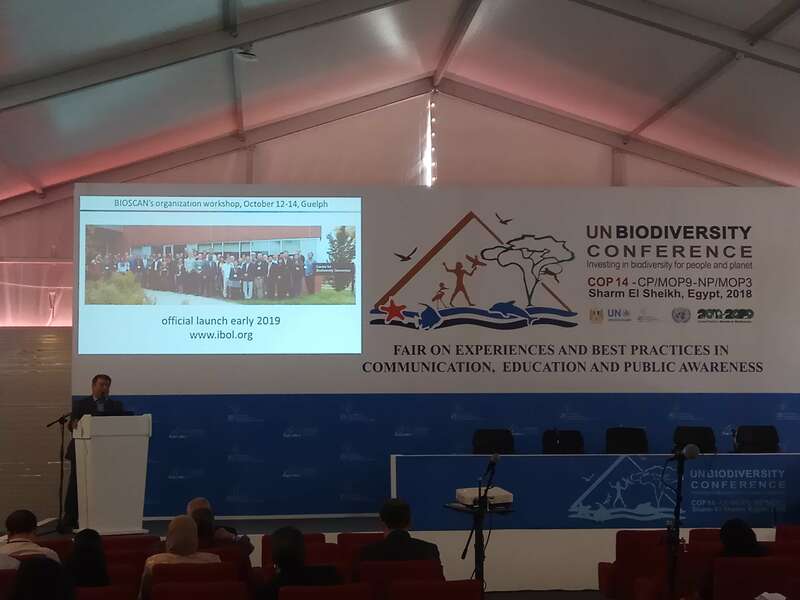 Dan Janzen, DiMaura Professor of Conservation Biology at the University of Pennsylvania and the Co-coordinator of BioAlfa gave a virtual presentation via Skype on BioAlfa, an ambitious project to ‘biodevelop Costa Rica for itself and for the world’. BioAlfa aims to make Costa Rica ‘a model bioliterate country for non-damaging use of its wild biodiversity’ by barcoding all species in the country. In doing so, Janzen says, Costa Rica will be the first tropical country to truly know its biodiversity. From barcoding a whole country to discussing the importance of collective enterprise, Tim Hirsch, the Deputy Director of the Global Biodiversity Information Facility (GBIF), presented on ‘informatics in support of the post-2020 framework for biodiversity’. Hirsch commented that the one billion species occurrence records currently in GBIF represent “a collective willingness and effort to realize that data shared is adding value to data.” He says that this value will only continue to grow as GBIF continues to collaborate, bringing in data from other sources such as DNA barcoding initiatives. Interview with Carlos Manuel Rodriguez, Minister of the Environment and Energy of Costa Rica at the GTI Forum. Interview with Tim Hirsch, the Deputy Director of the Global Biodiversity Information Facility (GBIF) at the GTI Forum. 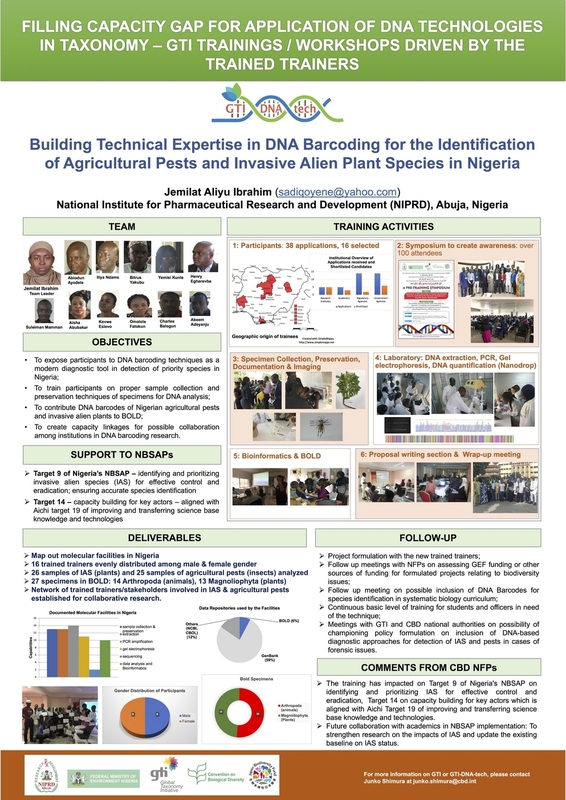 Collaboration was also at the heart of Jemilat Ibrahim’s presentation on GTI-DNA-tech, a capacity-building project for the implementation of DNA barcoding in developing countries. The project is a partnership between the Secretariat of the CBD and the Centre for Biodiversity Genomics (CBG) funded by the Japan Biodiversity Fund. 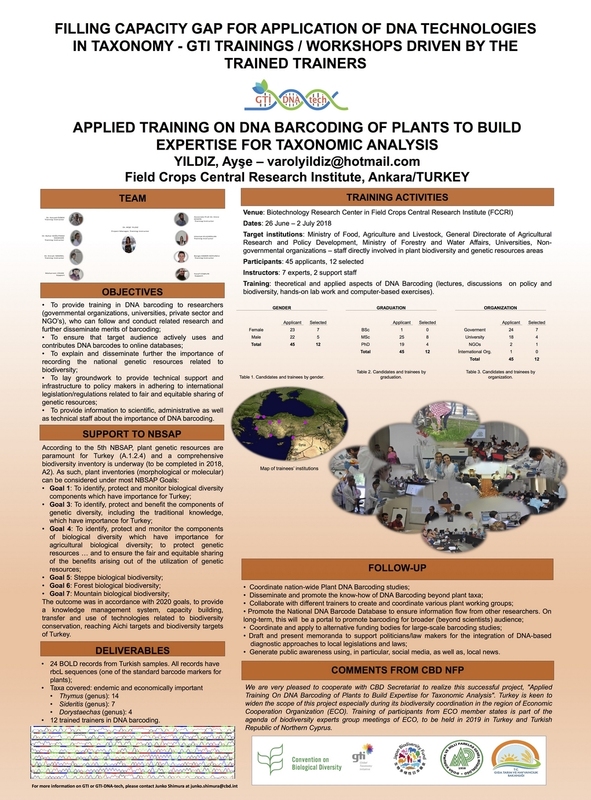 It trains people to become trainers in their own countries and regions increasing expertise in DNA barcoding in developing countries; ten workshops have been completed by the GTI trained-trainers between 2015 – 2018. On behalf of all these workshops, Ibrahim (Department of Medicinal Plant Research and Traditional Medicine at the National Institute for Pharmaceutical Research and Development (NIPRD) in Abuja, Nigeria) discussed the outcomes and sustainable plans developed by the trainers. 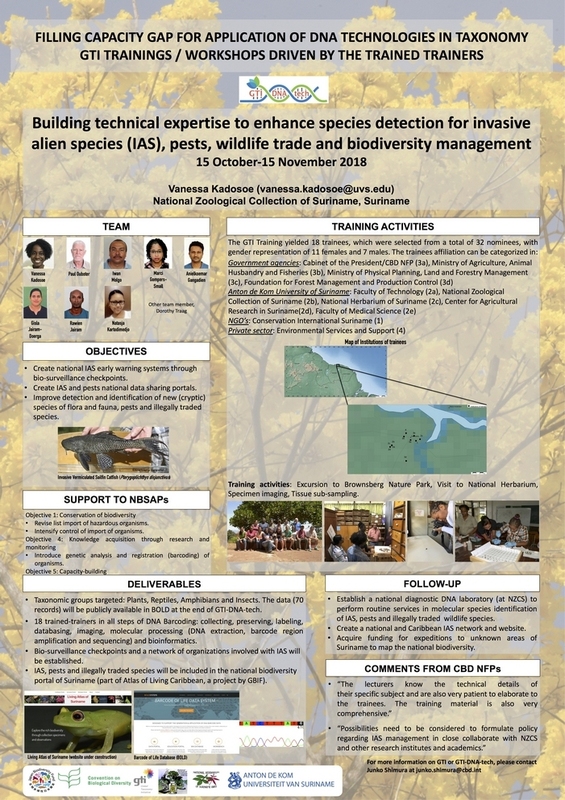 In addition, ten posters on each national course were displayed for the duration of COP14 at the Expert Kiosk on ‘Taxonomy and Invasive Alien Species’. 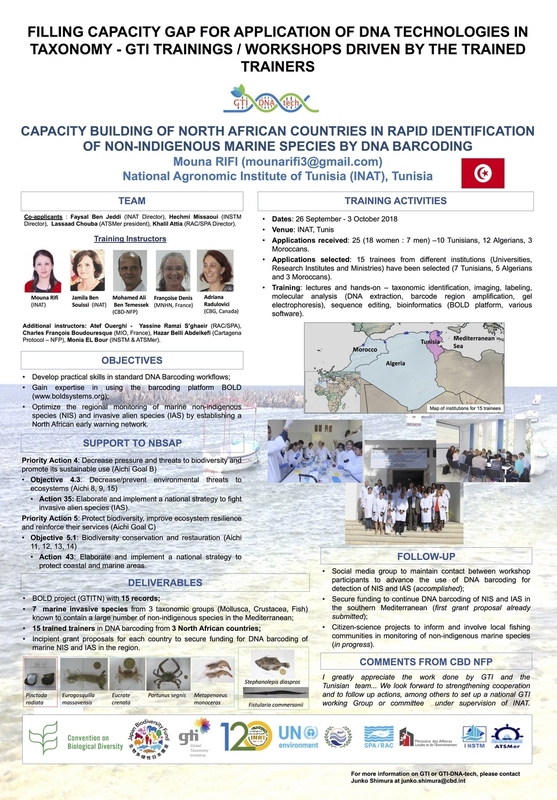 Including Ibrahim, two trainers (Mouna Rifi, National Institute of Agronomic Research of Tunisia, Tunis, Tunisia; Tatsiana Lipinskaya, National Academy of Sciences of Belarus, Minsk, Belarus) and one member of the project coordination team (Adriana Radulovici, CBG, Canada) joined GTIF representing the GTI-DNA-tech. During the discussion panel, Radulovici said that taxonomists can no longer work in isolation, but rather that they should take the opportunity to work on biodiversity with communities and governments. 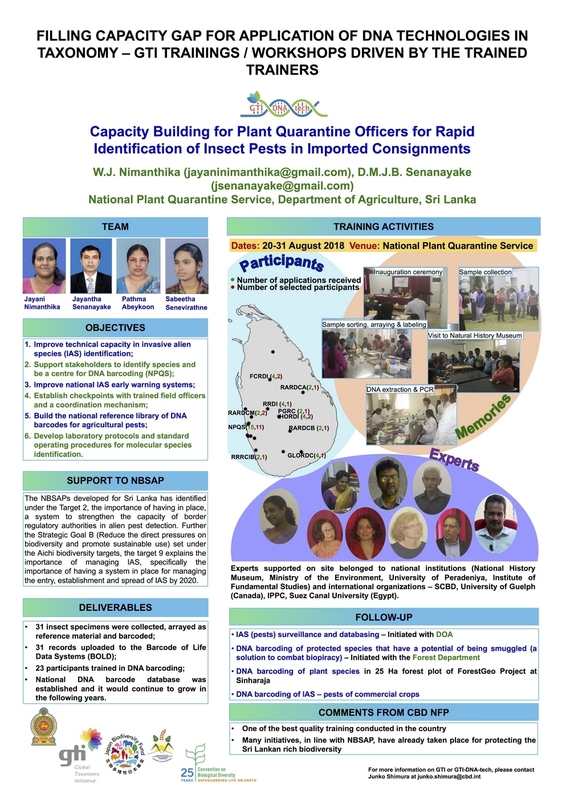 Posters on each national course displayed at the Expert Kiosk on ‘Taxonomy and Invasive Alien Species’. 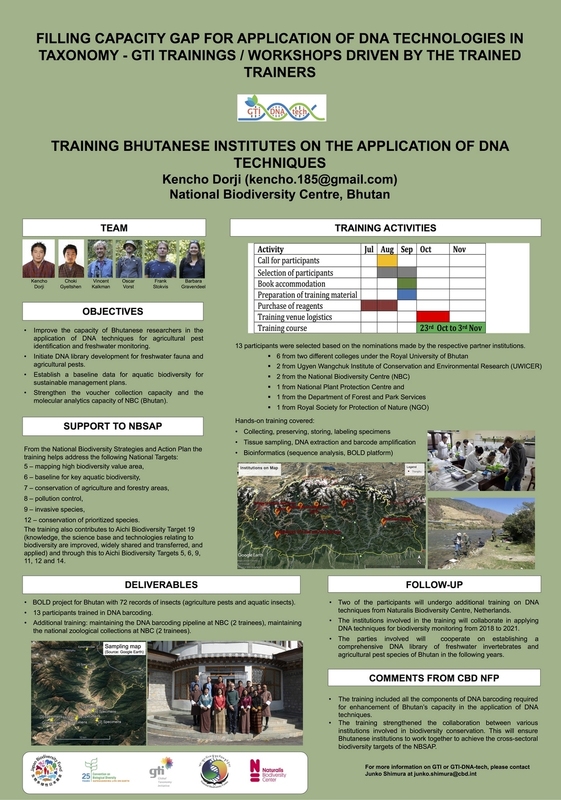 GTI-DNA-tech posters displayed at the Expert Kiosk on ‘Taxonomy and Invasive Alien Species’. GTI-DNA-tech posters displayed at the Expert Kiosk on ‘Taxonomy and Invasive Alien Species’ (top). 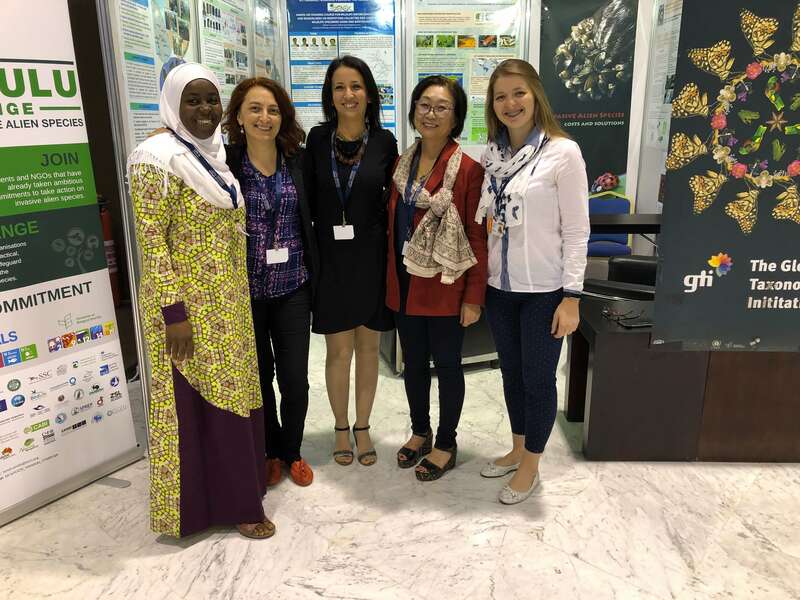 GTI-DNA-tech trainers (right) Jemilat Ibrahim, Adriana Radulovici, Mouna Rifi, Junko Shimura, Tatsiana Lipinskaya (left to right). GTI-DNA-tech trainers Jemilat Ibrahim, Adriana Radulovici, Mouna Rifi, Junko Shimura, Tatsiana Lipinskaya (left to right). The forum included other talks related to biological collections, databases, DNA barcoding, and classical taxonomy from representatives of the Consortium of European Taxonomic Facilities, ASEAN Center for Biodiversity, and Nature & Science Foundation, an Egyptian NGO. The GTIF symposium concluded with a presentation from Mehrdad Hajibabaei, Faculty Advisor for the Genomics Unit of CBG at the University of Guelph, Canada. 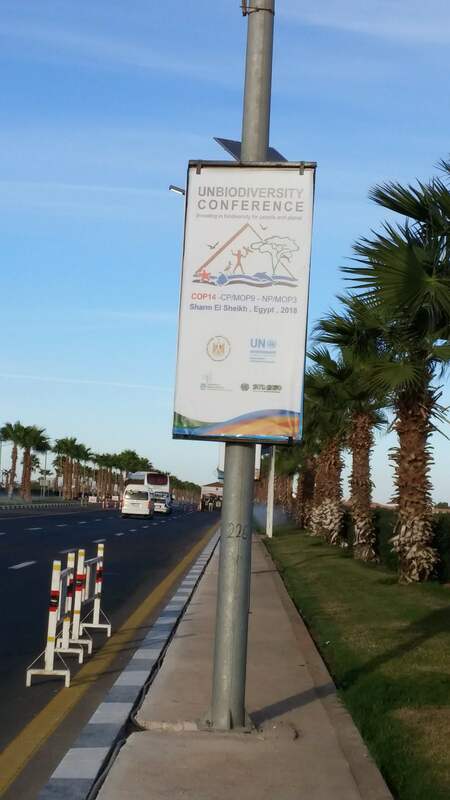 Hajibabaei discussed BIOSCAN, the second project of the International Barcode of Life Consortium and its role in providing a baseline for biodiversity monitoring. Mehrdad Hajibabaei, Faculty Advisor for the Genomics Unit of CBG at the University of Guelph, Canada discussing BIOSCAN. The GTIF forum concluded with a round-table discussion on the importance of taxonomy for CBD implementation included suggestions for reducing the taxonomic impediment for all citizens, and increasing opportunities for capacity-building in new technologies related to taxonomy, such as DNA barcoding. The outcome of the discussion was incorporated into a report submitted for consideration during the COP14 negotiations. Identify key areas for capacity building. During COP14, attendees were encouraged to present their research at side events. We highlight some events that discussed DNA barcoding. Adriana Radulovici (CBG, Canada) introduced DNA barcoding and its role in biodiversity assessments, identification of priority species and various applications with regulatory importance. In addition, iBOL, BIOSCAN, GTI-DNA-tech and the role of citizen-science were highlighted and discussed with participants. Yeimy Cedeño Solis (MINAE) and colleagues presented on the goal and strategy of BioAlfa, as well as the legal aspects of conducting a whole-country species inventory. The Consortium includes 24-member institutions, some of them involved in DNA barcoding projects. 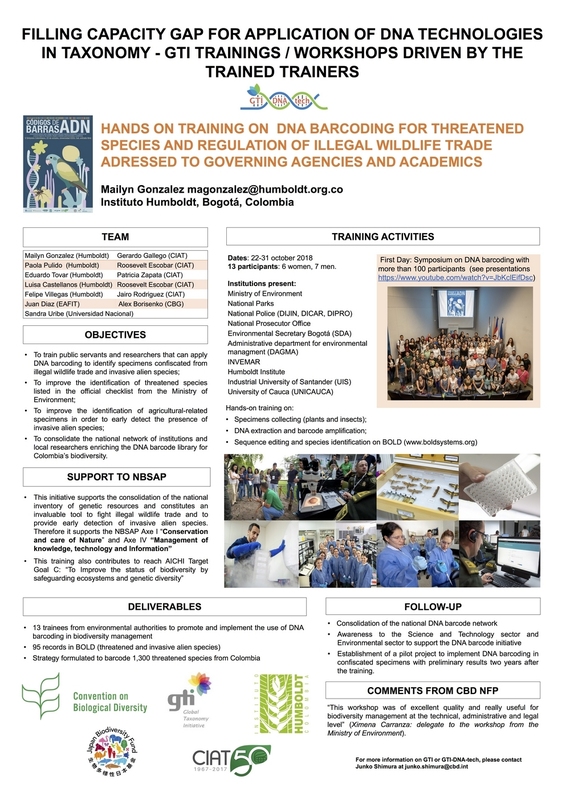 While not all partners were present, the Humboldt Institute and the Royal Belgian Institute of Natural Sciences (RBINS) discussed their respective DNA barcoding activities. The Humboldt Institute presented work related to CBD implementation, involvement in BIOSCAN, and the hosting of a GTI-DNA-tech training workshop in October 2018. RBINS presented on projects related to the validation of fish and seafood labeling, detection of invasive alien species, endangered and protected species, barcoding tissue of policy concern and RBINS collections. One example of technical and scientific cooperation showcased during the event was the training course titled, ‘Using DNA technologies for identification and study of alien and rare species’, organized jointly by BBI and GTI with funding from the Korean and Japanese governments. The GTI trained-trainers provided expertise for a regional course organized in Belarus that was open to CEE member countries that aimed to train people in DNA barcoding and lay the foundation of a regional barcoding network focused on aquatic invasive alien species and endemic plant species. COP14 requested the Secretariat of the CBD to facilitate capacity-building activities, especially for developing countries and those with economies in transition, to enable all countries to participate in the development and application of scenarios for the 2050 Vision for Biodiversity – ‘Living in harmony with nature’ where ‘by 2050, biodiversity is valued, conserved, restored and wisely used, maintaining ecosystem services, sustaining a healthy planet and delivering benefits essential for all people’. 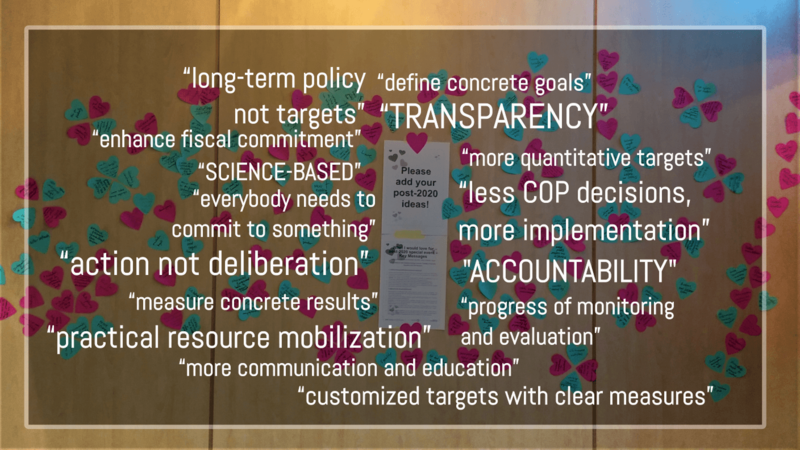 Participants were invited to include opinions on a range of issues related to the development of the post-2020 global biodiversity framework. The general message around the biodiversity crisis and climate change was that we need to act quickly! This action requires involvement from everyone in society including women, youth, local communities, and Indigenous peoples. 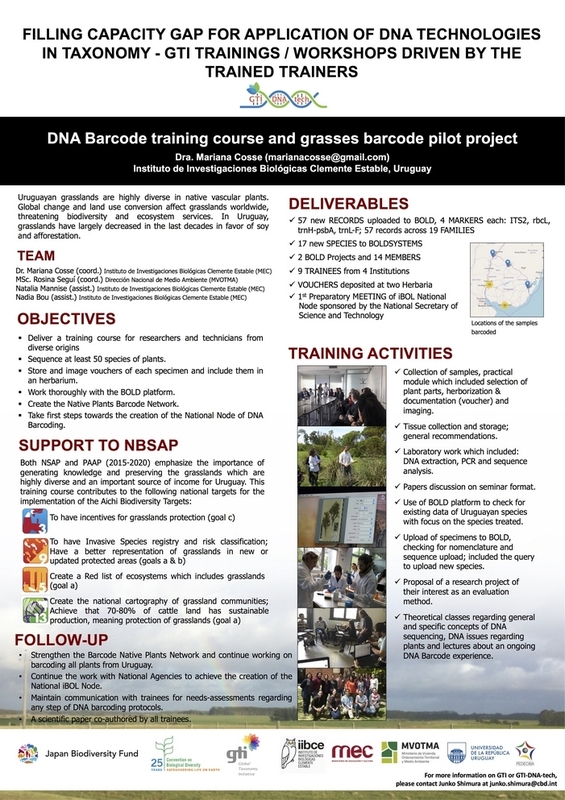 The International Barcode of Life (iBOL) Consortium is using DNA barcoding in aid of this endeavor; iBOL is a research alliance of 31 nations with a mission to develop and apply a globally accessible, DNA-based system for the discovery and identification of all multi-cellular life. Their vision is to illuminate biodiversity for the benefit of all life.